Former first lady, Konadu Agyemang Rawlings, never misses the cameras whenever she graces a public event. This is never because she is a former first lady (of course she is!) but mostly due to the grace and liveliness she adds to events. In this article, we dig up some pictures of the former first lady which proves to us that she is indeed a fashion goddess. 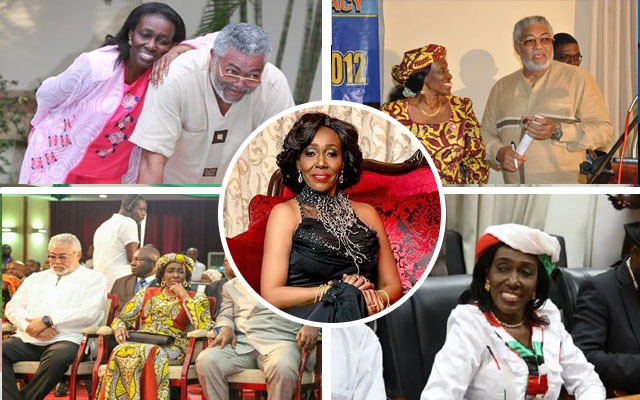 Konadu Rawlings had recently revealed to the press that her married life with former president Rawlings was not "love at first sight" and that it took time to grow in love with the former president. Known as the "Iron Lady" of her time, the former first lady resumed position as the first lady of Ghana when the country was faced with dire economic mishaps. It was during her tenure that the December 1st Women's Movement was established. This movement was to equip women with the needed entrepreneurial skills to survive the economic hardship of the country. But Konadu Rawlings never seems out of touch in active politics as she established a breakaway party from the opposition National Democratic Congress (NDC) named the National Democratic Party (NDP). At age 69, the former first lady still holds the dream of leading the affairs of Ghana as she believes there is more to offer for the economic transformation of the country.